All-time classic Panzer Corps is coming back with three new expansions for a total of fifty new scenarios. Each one has its own unique theatre of operations and scenarios, but all linked in a colossal branching campaign with complete unit carry over! In U.S. Corps ’42 you start with “Operation Torch” where brave but inexperienced American “rookies” land in the sands of North Africa and join their allies. They must take the lead on several actions against the French command in Morocco and Algeria and then head eastwards, where they will face the remnants of the Italo-German army in Tunisia in a total of 16 different scenarios. The second expansion begins the year after. In U.S. Corps ‘43 the goal is to liberate Sicily and use it as base from where to land on mainland Italy. The Allies have to overcome the resistance of the german army and open the road to Rome during another new set of 16 scenarios. In the third and final installment of the mega campaign, U.S. Corps ’44 – ‘45, you’ll lead the largest amphibious invasion in history, and with it, the Battle of Normandy. The plan is to land on several beaches in northern France, then to push east towards Berlin and finally put an end to the war for a total of 18 original scenarios! If you buy the three expansions together you’ll get one for free! How does it work? It’s easy! Once you add one of the expansions to your cart you will be offered to buy the other two at the discounted price of three at the price of two! Also tonight, on May 26, 20.00 (CEST), we are going to give players a sneak peek of the game on our official Twitch channel! This is the news all Panzer Corps fans were waiting for, no doubt: Panzer Corps: U.S. Corps is going to be released on Thursday May 26! Panzer Corps: U.S. Corps is composed of three different DLCs, each one with its unique theatre of operations and scenarios, but all linked in a colossal branching campaign with complete unit carry over! Start with brave but inexperienced “rookies” in the sands of North Africa, then assault the shores of Italy and fight your way up the peninsula, and eventually land on Normandy and take part to the final push for Germany! Learn how to wisely employ your troops to save your veterans for the next battles! 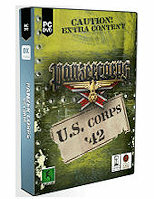 Get more information on Panzer Corps: U.S. Corps from its official product page. Despite the Japanese surprise attack on Pearl Harbour, Europe had been considered the main front by the United States from the beginning of the war. Here, Great Britain is increasingly isolated and the Soviet Union has been driven back, losing millions of men and tanks in the effort to gain time. Germany is close to winning the War, and the Wehrmacht is the arbiter in the Old Continent. Only the opening of a new front could give a chance to the Allies to reverse the tide! Today Flashback Games, is proud to announce a new exciting chapter in the series, with more content than ever! Panzer Corps: US Corps is composed of three different DLCs, each one with its unique theatre of operations and scenarios, but all linked in a colossal branching campaign! Start with brave but inexperienced “rookies” in the sands of North Africa, and lead them through the entire Western Front! Learn how to wisely employ your troops to save your veterans for the next battles! Panzer Corps: US Corps is ready to enter the Beta Phase! Enlist now and help us add the final touches! Important! If you apply for the beta for one of the three DLCs, you will be beta testing all of them!